Toy Story 3 brought in $41 million in its first day in theaters. "Toy Story 3" has become the favorite plaything for moviegoers as the animated sequel heads to a $100-million-plus opening weekend. The latest hit from Disney's Pixar Animation took in $41 million in its first day Friday, according to studio estimates. That puts "Toy Story 3" on track to join "Shrek 2" and "Shrek the Third" as the only animated films to top $100 million in their debut weekends. Reuniting voice stars Tom Hanks and Tim Allen, "Toy Story 3" will easily pass Pixar's previous best opening of $70.5 million for "The Incredibles." The weekend's other new wide release bombed. "Jonah Hex," the Warner Bros. comic book adaptation starring Josh Brolin, took in just under $2 million on opening day. 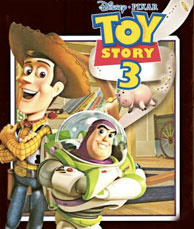 Animation expert Charles Solomon literally wrote the book on Toy Story 3 - it's in bookstores today.